The phaser is one of those pedals that can make or ruin your tone. When used incorrectly, this box of wavering echo and zing can drive even the most ardent fans to hit the kill switch on a band. Used correctly though, it can be used in just about any genre of music from rock, to psychedelic to country. Eddie Van Halen and Jimmy Hendrix used copious amounts of phase in their various tone incarnations and they seemed to do pretty well. The phaser pedal was actually the first pedal that TC Electronics put out on the market. 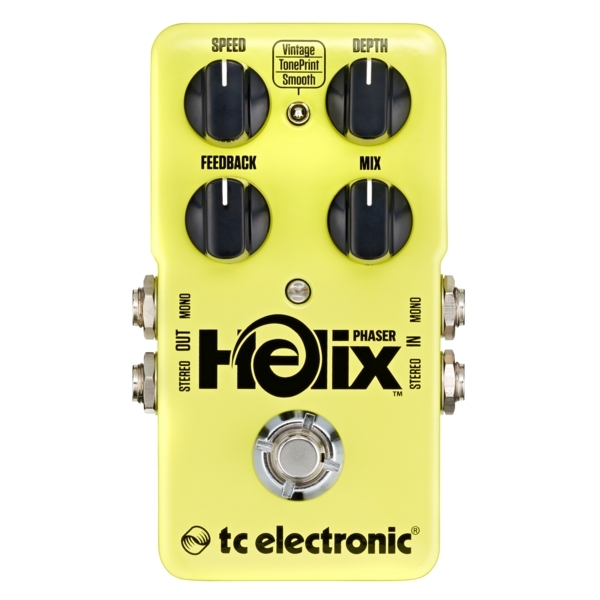 It’s been awhile since TC was new to the game, so we can expect that their new Helix Phaser is something a bit more refined and versatile than the phaser of yesteryear. According to them, “With its extensive set of controls, the Helix Phaser enables you to dial in everything from vibrant vintage-sounding Gilmour swirls, big and bold Van Halen sweeps to more modern phaser tones a la Smashing Pumpkins and Radiohead. Now add True Bypass and Analog-Dry-Through to the mix and you have your new favorite sonic drug.” A sonic drug sounds like a healthy addiction to have. The Helix is contained within a space saving single-sized enclosure with one switch and 4 knobs controlling, speed, depth, feedback and mix. Those all seem straight-forward enough and allow enough control to take your tone to new places without having to break open a 100 page manual to get started. The pedal is also part of their Tone Print series which means you can load in custom designed tones from legendary musicians via USB. It’s not a necessary thing to do since the pedal works right out of the box, but the option is priceless. Look below for a demo of this pedal (and the vibe) in action and DONT FORGET that we have just a few days left before we giveaway an Outlaw Effects Five O’clock Fuzz. Find out more about that contest here! Pedal Finder, LLC is a participant in the Amazon Services LLC Associates Program, an affiliate advertising program designed to provide a means for sites to earn advertising fees by advertising and linking to amazon.com. Additionally, affiliate links may go to Musician’s Friend, Google Advertising Network, Music 123 or Guitar Center. This means that some links will go to their website and Pedal Finder may potentially receive a commission for items purchased there.